Over the years Alan has written a number of books and contributed a number of articles on his love of rock 'n' roll. His A to Z of the singer Buddy Holly has received national acclaim and been heralded by Sir Paul McCartney as "a must for all diehard fans." DJ Mike Read stated that the book was "Proof of Buddy Holly's durability as both songwriter and artist." Alan went on to write "Elvis and Buddy Linked Lives," looking at the ways in which the lives of Buddy Holly and Elvis Presley were interconnected. 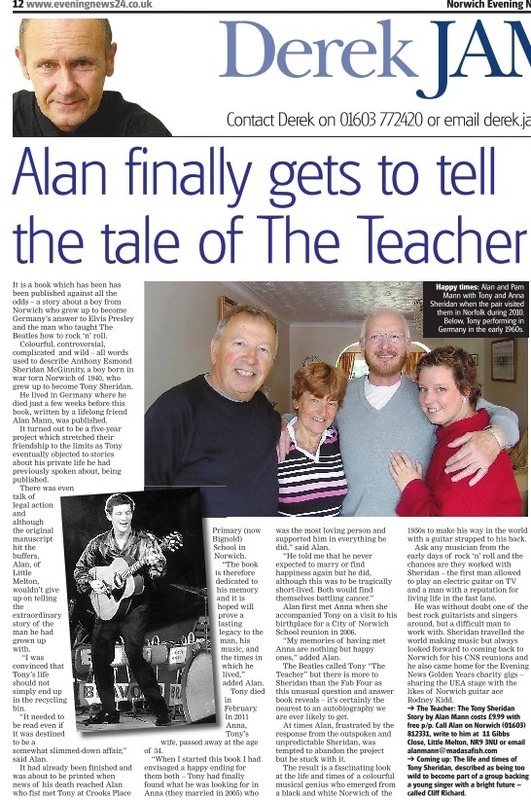 Alan is currently putting the finishing touches to "The Teacher - The Tony Sheridan Story which is due to be published in early 2013. To read about Alan and his books follow the links at the top of this page. NEWS UPDATE - The Teacher - The Tony Sheridan story is now available at £9.99 including post and packing. To place an order please fill in the coupon below and we will get back in touch with regards to payment and delivery of the book.